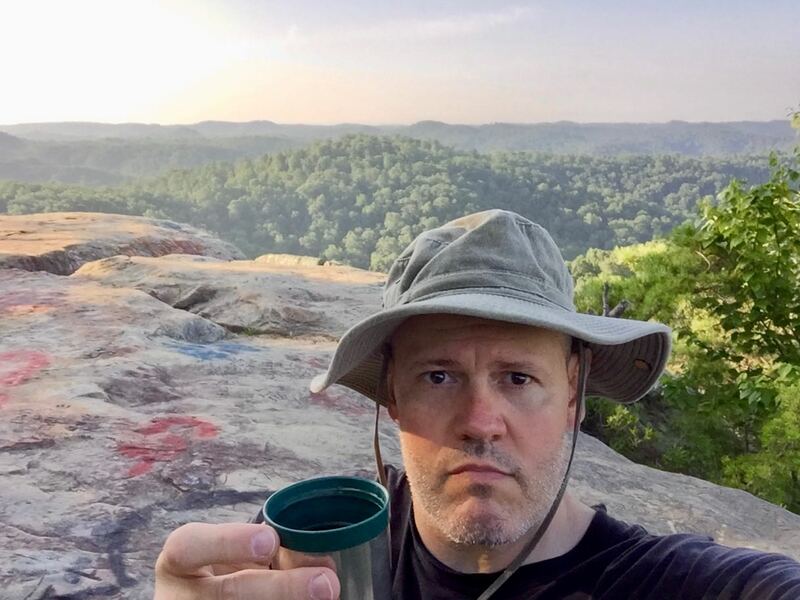 Michael Scott enjoying a cup of coffee on the summit of Lockegee Rock near Morehead KY.
As a young man, Michael spent much of his time seeking adventure and exploring the great outdoors. In addition to his affection for nature, he also relished technology and embraced it at every opportunity. In fact, his indoctrination to the Polaroid One Step sparked the beginning of his interest in photography. Inevitably, the natural synergy between nature and technology led Michael to become a passionate landscape photographer. Currently residing near Tulsa Oklahoma, he often visits the local areas for exciting new photographic opportunities. Although specializing in landscape photography, he continues to master the art of photography and takes pleasure on any occasion to capture a profound moment in time. Today Michael uses Nikon cameras and lenses. Some of his specific and most utilized equipment consists of a Nikon D800 with a 70-200 f/2.8E, 24-70mm f/2.8G, 14-24mm f/2.8, a variety of ND Filters, and a sturdy tripod. Behind each image is a story waiting to unfold. Although stunning and captivating, a great photograph should also communicate a story as witnessed through the eyes of the artist. A photographer uses equipment to capture an image, but an artist uses the equipment to capture a vision! Visit my Portfolio and Fine Art Gallery.